This well annotated Latin text combines four Aeneid texts previously offered by Bolchazy-Carducci and new content into one user-friendly volume. Containing 2596 lines this text makes the perfect introduction to Vergil's Aeneid for college students or advanced high school classes. 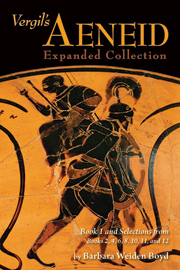 Offering all of Book 1 and selections from books 2, 4, 6, 8, 10, 11, and 12, this edition lets students experience the full scope of the Aeneid. The text contains scholarly and grammatical notes, well-organized vocabulary, and appendices.